Lerynee West of Redfield picked up her Powerball jackpot today. 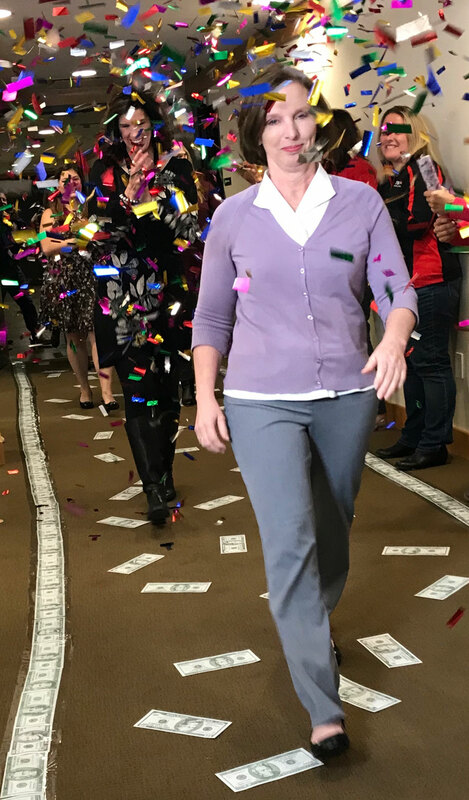 A 51-year-old single mom from Redfield has claimed the largest lottery prize ever won in the state of Iowa. 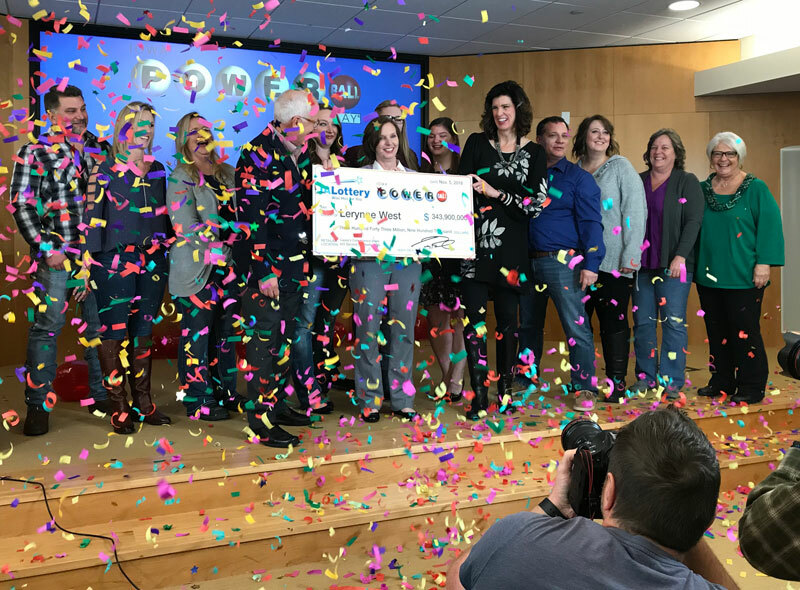 Lerynee West spoke at a news conference this morning at Iowa Lottery headquarters. West grew up in Earlham. She left high school at age 17. When she was 19, she earned her GED. West bought the winning ticket at the Casey’s in Redfield on Friday, October 26 for the next day’s drawing. 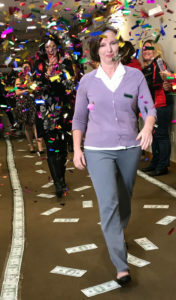 Leryne West walks through confetti at Iowa Lottery Headquarters. West has chosen to take a lump sum payment of $198.1 million, which is $140.6 million, after taxes. She’s already established a charity. West bought her ticket on the day she was moving into the first home she’s ever owned. West told reporters this morning the first thing she plans to buy with the money is a new car. West has been a “procurement analyst” for Wellmark Blue Cross Blue Shield. “So currently I’m retired,” she said today, to cheers from her family and friends. West has been a two-times-a-week lottery player. West says dreaming about what she’d do with a jackpot is “totally different” from the reality of winning one. West told reporters she a hard time convincing relatives she had the winning ticket. Finding the ticket is a big part of her story as well. Back on Friday, October 26, West was moving into a house in Redfield, the first home she’s every owned. Around noon, West asked her sister to take her to the Casey’s in Redfield. West has been a routine, two-times-a-week Powerball player. West thought she put the tickets in her purse. “Didn’t think of them again until Sunday morning,” West said. A friend who was out of town was first to tell West someone from Iowa had a winning ticket. West then called her sister to share the news that a winning ticket had been sold in Iowa. West’s sister sent a photo of the ticket and West went to the Iowa Lottery’s website to check the other numbers. “It took me about a minute, going back and forth, to figure out that I had won and I said to my sister: ‘Get that ticket. Get in your truck and get up here now and drive slow,'” West said. West started calling relatives, asking them to come to her home in Redfield, because she had won the lottery, but that took some convincing. With $140.6 million in the bank, after taxes are paid, West was asked if she intends to remain in Iowa. The website for the Callum Foundation indicates its grants will address needs such as poverty and hunger, education, animal welfare, and veteran affairs.